Thames Rockets is proud to introduce yet another super cool combo experience with London axe throwing. Begin your adrenaline experience with a 50 minute whirlwind tour of London on board the speediest speedboats on the Thames. Thames Rockets have been delivering #1 powerboat trips for over 11 years. So strap yourselves in and prepare yourselves for a blast from the best. Your ‘Ultimate London Adventure’ begins from our very own departure point at the iconic London Eye. Our guides are ready to welcome you and your party with their usual flair and wit to explore the capital up close and personal. Not only are they comedians and actors, but also closet history buffs. They love nothing more than to impress you with the more unusual stories of the greatest city in the world. After sailing under the world famous Tower Bridge it’s time hit the throttles and play the hits! Thames Rockets are famous for providing the most exciting, hair raising and thrilling speedboat experiences in the UK. Carve your way through the docklands at 30 knots (35mph!) with our trademark medley accompanying your ride. Twist and turn with the wind in your hair – because this is sightseeing, speedboat style! Once safely back to the London Eye it is time to put all that adrenaline to good use! WhistlePunks London Axe Throwing is the new trend sweeping the world. The experienced throwing coaches will get you throwing like a pro in no time. Then once you’ve got the hang of it it’s time to take you and your team through a tournament until the king or queen of axes is crowned. The instructors will kick off your 1.5hr extravaganza with a safety briefing and then move on to the throwing techniques you’ll need to get you sinking some axes. Once you’ve got the hang of that, it’s onto the tournament. 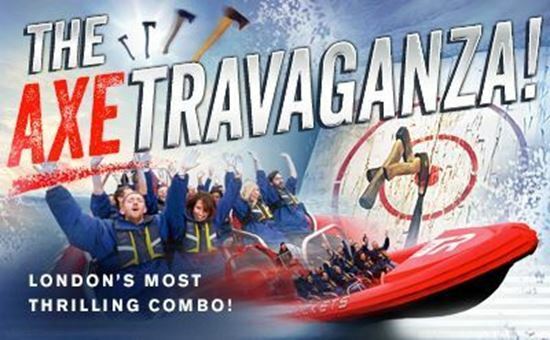 The perfect date, office party or a fun day with friends – the Axetravaganza is here. Please note it is your responsibility to transfer between venues. WhistlePunks operate Tuesdays to Sundays, all sessions last 1.5 hours. On Tuesday to Friday London axe throwing sessions are available at 2:15pm*, 4:00pm*, 5:45pm and 7:30pm. *Sessions subject to minimum numbers. On Saturday and Sunday London axe throwing sessions are available at 11am, 12:45pm, 3:15pm and 5pm. There are no minimum numbers for these session. "Please choose to do this on the Thames!" This activity is full of value on the Thames: 1) You will see so much, 2) It will almost always be good weather, 3) You really have a good thrill. DEFINITELY BOTHER DOING IT IN LONDON! We absolutely loved the entire experience , Geoff our tour guide was hilarious and made the experience amazing. I would definitely recommend this to all my friends. My 6 year old said it was so much fun and wanted to ride again. Everything was perfect, I went with a foreign school group of about 14-16 year old boys, they loved it! Geoff and Nick were amazing. I had to translate whilst Geoff told us about the historical buildings, he was so patient and made us all laugh. Very Highly recommended!! !